Nell stretched on top of the mattress. Her toes skimmed the soft cotton blankets before emerging from underneath them. No warm furry body guarded the bottom of her bed. No downy feathers danced on the currents from the vents. Alone at last. Relaxing, she smoothed Bei’s side of the bed. Okay, so the moment wasn’t as perfect as she wanted. She squeezed her eyes closed. Although her husband should have checked on her once Doc tattled. Her fingers dug into the synthetic fibers of Bei’s pillow. Dragging it close, she curled her body around it. The spicy scent of his soap drifted through her senses. Maybe she should connect to the WA and call him. With her luck, half the Syn-En aboard would come calling. Mastering private communication in cyberspace wasn’t as easy as in the last century. But this era did have a six foot, blue eyed, black haired benefit. Rubbing her itchy nose, she opened first her left eye then her right. Across the bed, their closet doors were open. Bei’s uniforms hung neatly in a row with his boots lined up underneath. One of her tunics sagged half-on, half-off its metal rod and her boots tumbled carelessly over his. A white feather clung to her bra on the deck. Iggy and Elvis’s cubs had a fondness for her clothing. Bei preferred they keep their puppy teeth to themselves, especially since they practiced hunting with him as prey. He didn’t appreciate being chomped on by invisible Amarooks. Giggling, she rolled onto her back. Not that he’d ever hurt a puppy. He always held them by their scruffs and calmly explained why he wasn’t edible. Then he recommended they try chewing on Apollie and the other Skaperian EmpShields. Nell’s chuckles swirled around the small room. Sensing her movement, the lights slowly brightened and the television screen embedded in the wall over the corner desk clicked on. Captain Pennig, the father figure of most of the Syn-Ens and her husband in particular, spoke calmly from the screen. He switched fluidly from one language to another without pause. Information was relayed to the refugees about where to find food, water, and clothing. Next, he explained how to search for loved ones and where to find their quarters, if they’d been assigned any. The screen flickered then Nell stared at herself. She chucked her pillow at the image. If she’d known making public service announcements were part of her job description, she’d never have run for office. Heck, she hadn’t run. She’d been drafted. An alarm blared, silencing her welcome message. Red ticker tape scrolled across the bottom of the screen: Alliance Debriefing. One hour, twenty-seven minutes overdue. “What! Why didn’t you wake me earlier?” Nell sprang from the bed. Fermites swarmed her feet, fitting her with socks and shoes as she walked. The double doors leading to the hall snicked open at her approach. Snatching a protein bar from the desk, she strolled out. She bit the corner of the foil wrapper and ripped it. Hunks of nuts and fruits bubbled under the coating of chocolate. Her stomach rumbled. She tore off a bite and chewed. Sugary sweetness chased aside the salty nuts. Man cannot live by chocolate alone. Thank God, she was a woman with a chocolate survival gene. At the next intersection, she turned left. Her chewing slowed. No one guarded the elevators. A Syn-En always stood sentry. This level housed all the leaders of the Neo-Sentient Alliance and their families. Access was strictly controlled and enforced. If someone took out this floor, the alliance was over. And so was the war. She swallowed her mouthful then allowed the biometric reader embedded next to the elevator door to scan her fingerprints and retinas. The elevator acknowledged her command with a chime. The skin between her shoulder blades tingled. Shifting to the right, she eyed the corridor behind her in the reflection of the stainless steel panel. Nobody. Perhaps she should stop watching horror movies for a while. A decade or two at the most. Her leg bounced with impatience. Okay, she could watch the occasional zombie movie. She pushed the call button again. A sliver of light grew from the top of the elevator and extended to the floor. The bell chimed again, and the doors slid open. Six Syn-En stared back at her. The grim set of their mouths softened and the darkness left their eyes. As one they raised their right arms. Green diagnostic beams shot out of their wrists, washing over her. Bald Cartagena joined London placing themselves in front of her before the doors closed. The soldiers formed a close circle around her, like petals on a bud. “Again?” Okay, maybe Nell had gotten turned around two or ten times. But that was at least a week ago. And to be fair, rooms and dead ends now stood where there had been throughways before. It was a very big ship, getting divided into small pieces to make room for all the refugees. Although if Nell had known getting lost was a free pass on a meeting or two she might have used it before. Cartagena hissed through his teeth and shook his bald head. Nell’s nape prickled. Bei must have pinged his men, ordered them to be silent. She clasped her hands in front and unlocked her mental door to the WA. A wall of steel blocked her path. That was new. She tapped on it. The sound echoed hollowly around her. Why had he shut her out? What could possibly be so bad that… Her musing screeched to a halt. No. No way. London had said Bei was unharmed. Syn-En didn’t lie. The elevator coasted to a stop. After a heartbeat, the doors slid open. More Syn-En lined the hallways. All nodded to her as she passed but none uttered a sound. The soldiers only put on such a display for enemy delegations and funerals. Her legs wobbled. Oh, God. She hadn’t asked about Iggy, Shang’hai, or Rome. Could one of them have been seriously injured or wounded? Why hadn’t anyone called her? She would never forgive herself if she slept while one of them needed her. Silver streaked her hands and disappeared up her sleeves. Without a word, London and Cartagena marched forward in lock step. The other four soldiers waited a heartbeat then moved in formation, sweeping Nell along. London and Cartagena side-stepped. The double doors opened to the conference room. Nell stepped into the room and walked down the aisle toward her husband and the Syn-En team sitting on the raised dais at the front of the conference hall. Facing the delegates, Bei rose from his chair. Wreckage filled the screens behind him. Doc leapt to his feet and raised his arm. Bei cleared his throat and shook his head once. Doc didn’t scan her. He clamped his mouth shut and stood at attention. Standing beside him, Rome winked at her. Shang’hai grinned from her position at the far end of the table. Her pink dreadlocks cascaded over her right shoulder. Heads turned. Murmurs rippled through the audience. A few pointed at her. Nell squared her shoulders. She’d always had that reoccurring nightmare where she arrived late to take a test. This was just as bad. She glanced down. At least, she wasn’t naked. One by one, the delegates rose as she passed. She nodded to the aquatic Horix, bubbling in their tanks. Shook the tentacles of the spidery-limbed Thraxic. Waved to the four-finger humanoid Haracts. Bei pulled out the free chair on his left. The motion was fluid. His features relaxed. But she smelled the singed edges of his anger. It was an order. She swallowed the lump in her throat. Of all the days to sleep through the alarm, she’d picked the one where Bei needed her most. She eyed the wreckage as she climbed the two steps onto the dais. Fabric rustled. Chair legs squeaked. The delegates were resuming their seats. Great, they were playing good Syn-En, bad Syn-En. Bei pointed to the chair. Nell rounded the polished stone table. Leave it to her husband to add irate Syn-En to the volatile mix. She hooked her pinky through his. Wow! Okay. She’d let him be mad for a little while. Straightening her pinky, she began to lower onto her chair. 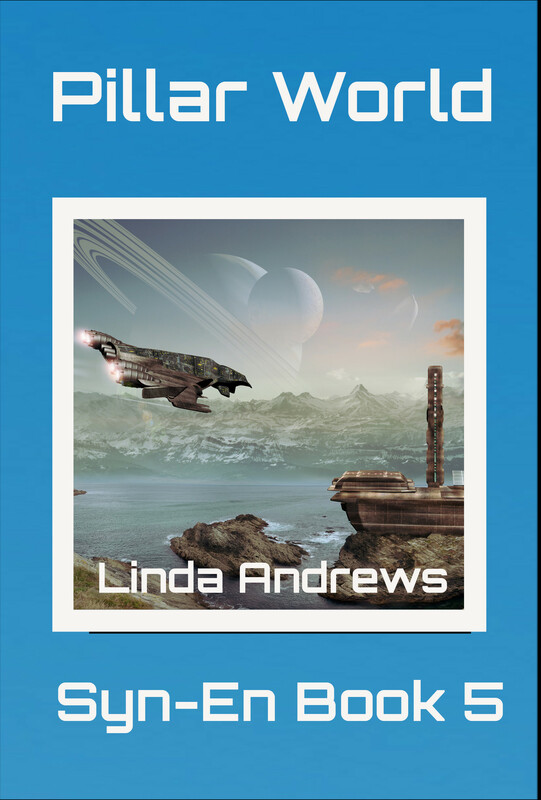 This entry was posted in Books and tagged cyborgs, SciFi, sequel, Space opera, Syn-en. Bookmark the permalink.